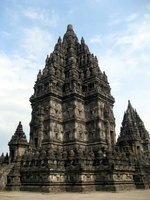 The six slender Hindu temples of the Prambanan Archaeological Park (a UNESCO World Heritage Site) were built in the second half of the 9th century, when a Hindu dynasty had succeeded the Buddhist house of Shailendra which had the Borobudur temple built. The six main temples were surrounded by 244 smaller structures arranged in a mandala. Of these only a dozen have been restored. When in the 10th century the Mataram court moved its seat to East-Java, the Prambanan temples were deserted and an earthquake in the 16th century made them collapse. They were rediscovered in 1811 during the short British rule of the Dutch East-Indies, but serious restoration efforts only started in 1930. Restoration remains an ongoing effort; the temples were seriously damaged by an earthquake in 2006 and it took five years to repair them. Though the Hindu temples are the landmark of the archeaological park, it contains three more temple compounds, Buddhist in nature and predating the Hindu temples. When walking north from the Hindu temples one encounters Candi Lumbung, Candi Bubrah and Candi Sewu in this order. Neither should one skip a visit to the Museum and the Audio Visual Hall. There is a free hop-on hop-off mini-train to facilitate covering the 1 kilometre extent of the park. In the greater area of 30 km2 referred to as the Prambanan Plain there are many more ancient temple locations, some perfectly restored, some only recently discovered. Reason why the Department of Archaeology in 2012 proposed to give Prambanan Plain a protected status, which would strictly regulate building activity in the area. Closest to the park, but outside it, are the Plaosan temples. 6:00am to 5:00pm. Since August 17th, 2012, one is obliged to wear a batik sarung, because the site is considered sacred. The sarung is provided for free. Of course one has to return it at the end of one’s visit. One is only allowed to enter the temples wearing ‘soft shoes’. As a foreign visitor one has to pay the equivalent of USD 25 for admission to the park, children aged 3-10 pay USD 15. Combination tickets Prambanan/Ratu Boko are available for USD 40 (children USD 25). This means one saves USD 10 per person, as a ticket for Prambanan only costs the same as for Kraton Ratu Boko only. The combination ticket includes free shuttle service between the two sites. The Hindu temples are dedicated to Trimurti, the trinity of Brahma the creator, Shiva the maintainer and Vishnu the destructor, and the animals that serve them. The central and highest (47 metres) one belongs to Shiva Mahadewa, on its left when facing it is the temple of Brahma, om its right Shiva’s temple. The smaller temples in front of these are (from left to right) for the swan Angsa, the bull Nandi and the eagle Garuda. The temple of Shiva has four rooms, the central one featuring a 3-metre high statue of a meditating Shiva standing on a lotus flower. In the other three rooms there are a statue of Shiva as teacher (Mahaguru), a statue of Ganesha the god with an elephant head, and one of Shiva's wife Durga. The latter statue is also known as Roro Jonggrang after a legend which seems to have little to do with the original intent of the temple complex, but rather with a daughter of king Prabu Boko (of the Ratu Boko court). The reliefs in the gallery depict part of the Ramayana epos in 41 panels, the conclusion of which can be found in the Brahma temple. Shiva traditionally rides on a bull called Nandi. Indeed inside the smaller temple in front of Shiva’s one finds a 2 m statue of a resting bull. The temple of Brahma is somewhat smaller than Shiva's. Inside stands a statue of Brahma with four heads looking in the four main directions. The reliefs of the temple tell about the war between Rama and Rahwana, which is the concluding part of the Ramayana epos. The smaller temple facing that of Brahma is dedicated to Angsa, the swan which is Brahma's mount. However, the statue of a swan that should be inside has been lost. The temple of Vishnu is similar to the one of Brahma, both in shape and in ornamentation. In it's only room stands a statue of four-armed Vishnu holding the attributes Gada (a club), Cakra (Vishnu's special weapon), Tiram (a winged oyster), and a bud of the holy lotus flower. The reliefs of the parapet depict the Kresnayana story. Vishnu's mount is the eagle-like bird Garuda, so the smaller temple facing Vishnu's temple is the Garuda temple. Again it is similar to the Angsa temple. There ought to be a Garuda statue inside, but nowadays in its place stands another Vishnu statue, which was found underneath the Garuda temple. Candi Lumbung is a smaller temple complex within the Archaeological Park. One passes by it when heading north to Candi Sewu complex. It consists of one main temple surrounded by 16 candi perwara or guard temples. Its Buddhist nature can be inferred from the stupa roofs. Lumbung means ‘rice barn’ in Javanese, supposedly the central temple looked like a traditional rice barn. Of late the complex has been well restored. 150 metres north of Candi Lumbung one reaches the remains of Bubrah temple. It is thought to be one of four temples once located around Candi Sewu at the points of the compass. This southern one is the only one still in existence, and only its base remains. The Javanese name Bubrah means 'in ruins', because that is how local people have always known it. Candi Bubrah is surrounded by a fence and restoration has started in 2016. Candi Sewu (thousand temples) is the second largest Buddhist temple complex in Java after Borobudur. It was most likely built in the same era as Borobudur and was intended to serve as a royal temple. The complex consists of a central main temple surrounded by 249 candi perwara (guard temples) arranged as a mandala. Those guard temples gave the complex its name, sewu in this context meaning ‘many’. The first studies on Candi Sewu date from 1807. The Indonesian government organized the total restoration of the main temple between 1981 and 1993. After a setback due to the 2006 earthquake restoration of the guard temples now is an ongoing effort. The main temple comprises one main room with four adjacent doorways. The roof consists of nine stupas. Two dwarapala (giant) statues stand guard at the entrance to the complex. While you are in Prambanan Archaeological Park, do not skip the museum. Besides the usual artefacts you find here some interesting maps and historic pictures. 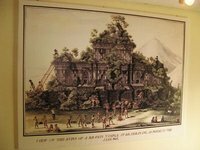 Among the latter a hilarious contemporary rendering of how the Hindu ruins were cleaned of overgrowth after their discovery in 1807. Also portrayed is a gold chalice, part of the so-called Wonoboyo hoard, discovered in 1990 by a farmer in his field. The chalice is dated beginning 10th century and features detailed scenes from the Ramayana epic. Not far from the museum is the Audio Visual Hall, where they show an thought-provoking movie comparing the lifestyle of the Javanese around 900 A.D. with life in modern Jakarta. Depending on traffic and location of departure, a car or taxi ride from Yogyakarta to Prambanan may take from 15 minutes up to an hour. From downtown Yogyakarta (Tugu railway station, Malioboro street, the post office) or from Adi Sutjipto airport, take Trans Yogya bus line 1A to Prambanan terminal. Within the UNESCO site there is a small Garden Restaurant decorated with some antiques, good for a snack and a drink when one needs a rest from strolling the site. Poeri Devata Resort Hotel - The most upmarket Prambanan has to offer. It is conveniently located at a few minutes walk from the ballet venue, therefore a good choice if one does not want to return to Yogya at night after attending a performance. There is a string of budget hotels on Jalan Candi Sewu, the road where one finds the entrance to the UNESCO Site: Candi View, Prambanan Indah etc. This is version 9. Last edited at 21:23 on Nov 5, 17 by theo1006. 8 articles link to this page.